The Skincare Series: Moisturizer – amandarobots. Regardless of your skin-type or the time of year or your gender, you should be using moisturizer. It helps rebuild the moisture barrier in your skin if you have dry skin, and if you have oily skin, skipping out on the moisturizer can actually make your skin oilier. If you’re oily, not using moisturizer can cause your skin’s oil production to go into overdrive to compensate. This makes your skin oilier in effect. Instead of skipping it altogether, go with an oil-free gel formula like this Clinique one. 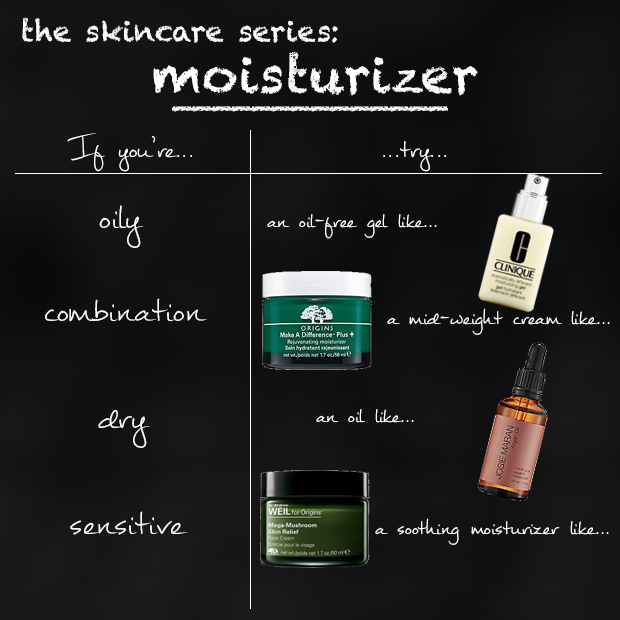 If you’re combination, finding the right moisturizer can be tricky, depending on whether your skin leans oily or dry. Try a mid-weight cream like Origins Make a Difference Moisturizer if your skin leans dry. If it’s oilier, you might want a slightly lighter moisturizer like Origins Make a Difference Treatment. If you have dry skin, you’ll want to go for an effective moisturizing treatment. You can either use a heavy cream or an oil like Josie Maran Argan Oil. If you have sensitive skin, like with your toner, you want a soothing product. Doctor Andrew Weil for Origins Mega-Mushroom Cream is fantastic at soothing sensitive skin and reducing redness. Like with all the other parts of your skincare regime, it’s best to get samples of moisturizers if you can. Don’t be afraid to switch your skincare with the seasons – combination skin, for example, might lean oily in the summer but dry in the winter. Make sure you tailor your moisturizer to what your skin seems to need. « I’ve been featured in The Wall Street Journal!